We are a leading Wholesale Distributor of sofosbuvir tablet and sofovir tablets from Chennai, India. We hold expertise in offering our valued customers high quality Sofosbuvir Tablet. Offered tablet is widely used in the treatment of chronic hepatitis C (CHC) infection. This is processed using chemical substances in conformity with industry standards. The offered tablet is also tested on different parameters to ensure its effectiveness and longer shelf life. Available in diverse packaging options, this is easily offered to our clients at affordable price. We deal in offering Sofobuvir Tablet to the clients. We have huge stock of these tablets in order to fulfill the rising demand of the healthcare and medical industry. 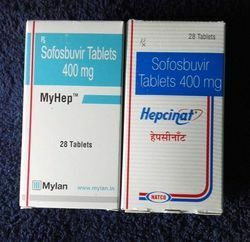 These are used to treat hepatitis C infection. Apart from this, these are well known in market due to their superior quality, longer shelf life and competitive prices. To add on, these tablets are available at cost effective prices.